Please accept this invitation to worship with us! Saint Athanasius the Great is an Eastern Church, a Church descended from the traditions and customs of Greece rather than Rome. The word “Byzantine” comes from the city of Byzantium, the old name for the city of Istanbul (Constantinople), which applies to us the same way the world “Roman” does when it describes Catholics of the Western (Rite) Church. We believe as Catholics do, and bishops appointed for us by His Holiness, Pope Francis I, govern us. However, because missionaries from Greece, Saints Cyril and Methodius, converted our ancestors, we learned to think of God and to worship Him in the Eastern “style.” Our Sui Juris Autocephalous Church (the Carpatho-Ruthenian Byzantine Catholic Church, serving Carpatho-Rusyns, Hungarians, Slovaks and Croatians) was reunited with Rome in 1646 after the Roman and Byzantine Churches split in 1054. The Pope of Rome guaranteed that we would always be permitted to retain our own Byzantine customs and most ancient traditions. Here, at St. Athanasius our services are in English, with some parts in Old Church Slavonic (our original ancient liturgical language; an early form of what later became Russian, Ukranian, Slovak, etc.). Upon entering or leaving the church building, Byzantine Catholics make a bow and a sign of the Cross, instead of genuflecting. Byzantine Catholics, make the sign of the Cross from the right to the left, the opposite of what Western Catholics do. The East stresses the Divinity of Christ – while the West, His humanity. Ours is the older way of making the gesture. Because the early Church Fathers wanted to be sure that the people would learn and participate in the services, they forbade musical instruments in the church. We take great pride in the fact that our people can participate fully without the assistance of any instruments. You will notice that there are no statues in our church. The Greek Fathers feared that statues would lead us to the worship of idols. The Greeks worshiped idols anyway, and the Church Fathers wanted to make sure that the Christian church would be distinguished from pagan religions. In the place of statues, we use icons (the Greek word icon means image), which are flat paintings of Our Lord God and Savior Jesus Christ, His most Holy Mother, the Ever-Virgin Mary, important feast days, and the saints. Icons look odd to many people, as though the artist was poorly trained; this is not the case, however, because icons are “written” according to traditional, most ancient standards. They look odd to modern eyes because they are intended to be symbolic rather than realistic. During the Holy and Divine Liturgy (our name for what the Latins call “Mass”), when the time comes for the distribution of the Most Holy Body and the Most Precious Blood of Our Lord God and Savior Jesus Christ (called “Holy Communion” by the Latins), do not be afraid to receive if you are Catholic or Orthodox and in the state of Grace. “Holy Communion” is given under both forms, bread and wine, using a golden spoon. The spoon simplifies things for us, since we use leavened bread, (baked with a special recipe and marked with special markings – and called prosphora) rather than the unleavened (flat wafer) bread used by the Latins. Communion “in the hand” is NOT an option. To receive the Most Holy body and the Most Precious Blood of Our Lord and Savior Jesus Christ, just approach the Priest with your arms folded in the form of St. Andrew’s Cross (X), tilt your head back slightly, and open your mouth. The priest says a prayer; you DO NOT answer “Amen.” Be sure to chew the Sacred Species carefully. No one has ever choked on a “Particle” here; neither will you. Your Sunday obligation is fulfilled by attending the Holy and Divine Liturgy (“Mass”) in any Catholic Church of any tradition. Catholics should experience as many of the Eastern “Rites” as they can. “Catholic” means “in the fullness of,” and it is through the variety of “rites” that the Church reveals its universality. Please feel “at home” praying with us, and please come visit us often and bring or tell a friend! A “rite” is a complete tradition – the unique way that a particular community of the faithful perceives, expresses, and lives its Christian life with the Catholic Church. HOW MANY RITES ARE THERE IN THE CATHOLIC CHURCH? WOULD IT NOT BE BETTER TO HAVE ONE “RITE” FOR EVERYONE? No. The many “Rites” are the most powerful witness the Catholic Church has to show the universality of the Church. In the essentials of our Faith – the Bible and Tradition, there must be unity. In the expression of the Faith – in liturgy and customs, there is liberty. IN THE EARLY CHURCH WHAT WERE THE MAJOR CENTERS FROM WHICH THE VARIOUS “RITES” DEVELOPED? Christianity spread from the city of Jerusalem – in other words, from the East. From Jerusalem, Christianity spread to Antioch, Alexandria, Rome and Constantinople. All Eastern Christians are descendants of the Eastern centers (Jerusalem, Antioch, Alexandria and Constantinople). All Western Christians are descendants of the Western center, Rome, which until the fifth century observed the eastern “Rite” of Jerusalem. HOW DID THE RITES BEGIN? The Apostles received the commission to “Go, ye therefore, and teach all nations…” (Mat 18:19) from Our Lord, Jesus Christ. As the Apostles went forth to preach the “Good News of Salvation” through Jesus Christ, they found themselves in many different lands and among many different peoples. To all of these people they preached morals and the truths of the Faith, as they had heard them from the lips of Our Lord. They administered all of the seven Sacraments instituted by Christ. Naturally, the ceremonies were performed differently, according to the customs of the people. The music used varied with the different nations, as did the language. While all Catholics (Byzantine, Laotians, etc.) profess an identical faith, their method of expressing and living that faith differs accordingly as their mentality and cultural backgrounds differ. Thus, in the very early Church many diverse “ways” arose. WHY IS SO LITTLE KNOW ABOUT THE EASTERN CHURCHES? WHAT DOES THE LATIN POPE OF ROME SAY ABOUT THE EASTERN CHURCHES? “All members of the Eastern Rites should know and be convinced that they can and should always preserve their legitimate Liturgical Rite and their established way of life…” –from the Decree on Eastern Rites of the Second Vatican Council). today, more than ever, the Holy See of Rome looks to the Eastern Churches as the source of unchanged, “undeveloped” Apostolic Tradition. WERE THERE ANY POPES FROM AMONG THE EASTERN CHURCH? Yes, there were about 20 Popes of Eastern origin, mostly Greeks. For the first few centuries in Rome, the Holy and Divine Liturgy was always celebrated in the Greek language. ARE ALL EASTERN CHRISTIANS CATHOLIC? No. In fact, a greater percentage of Eastern Christians are Orthodox. The Orthodox are Eastern Christians who are not subject to the Roman Pontiff. Yes they are, since the Orthodox Church is of Apostolic origin. In fact, in case of an emergency, any Catholic (Byzantine, Latin, etc.) may request the Sacraments from an Orthodox Priest. Read a parishioner’s article on why he changed from the Roman Rite to the Byzatine Rite. 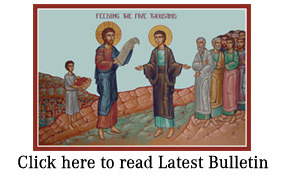 See the parish bulletin for the upcoming Liturgy schedule. Come and worship. Thank you for visiting and accept our invitation to immerse yourself in the awesome majesty and the ancient faith of our beautiful Byzantine Divine Liturgy, enjoy our hospitality, and tell a friend! I attended one of your services about a year ago, and found Fr. Sid and his message of the power of the Holy Spirit and what He can do if we have enough faith. I hope that your church is growing and that Fr. Sid has many more years to teach the Catholics that they have the fullness of the faith and the power to heal and prosper…..God bless your church! I have been a Catholic priest for 6 years. I have a special interest in early Church history and through my study have developed a great love and admiration for the Byzantine rite. This past January i was granted bi- ritual faculties by Bishop John Kudrick in order to help a very small group of Ruthenean catholics with celebrating the Divine Liturgy in the diocese of Green Bay, WI. I am still learning, but i have developed a new respect for the universal church. I also teach a college course on ecclesiology to future lay leaders and deacons. During this course many are surprised to learn there are ” other” catholics. God bless you in your ministry. Blessed is the kingdom of the Father and of the Son and of the Holy Spirit, now and ever and forever. Amen! I can’t believe you guys sing a capella. The Churches of Christ are that way. Orthodox churches also sing a capella. I also found out that the Primitive Baptists, some Presbyterians, the Old Regular Baptists, and the Plymouth Brethren also sing a capella. I am so glad to have met many Eastern Catholics and they have answered so many questions I have had that many of the Western Latin churches could not. I love the depth and the wisdom brought to my life from the Byzantine Catholic Church. Much of that wisdom I have brought back to members of my parish and many of them have found themselves in awe of the magnitude. I have encouraged many of the Latin Rite Catholic churches to visit St. Athanasius parish and worship with you for as long as they can. I prefer they do so for a year in the life of the Eastern church. They would find themselves rich with knowledge. I hope to be a regular attendee of your services in this coming year.